The Tribunal will exceptionally deliver in public four judgments adopted at its 123rd Session separately and earlier than the remaining 93 judgments adopted at the same session. Those judgments will be announced in public on Wednesday, 30 November 2016 at 3 pm at the ILO (Room XI, floor R2). They will be published on the Tribunal’s website (ilo.org/trib) shortly after the delivery. These two EPO cases (third and fourth above) are probably of high impact and more profound than, e.g. the van Breda case which SUEPO is pressing on [PDF] (more to do with finance and illness, less with human rights), but we shall know for sure at the end of this month. “Put simply, the EPO hires some of the potential overseers/critics, which is a common technique that only the affluent can afford to pull off (oil companies habitually do this in countries that they pollute).”Making the EPO wholly accountable or holding particular managers accountable where they deserve it has gotten rather difficult not just because of impunity/immunity (with ILO being years behind, drowning in additional EPO complaints) but also entryism. Put simply, the EPO hires some of the potential overseers/critics, which is a common technique that only the affluent can afford to pull off (oil companies habitually do this in countries that they pollute). Transparency International (TI) ‘merger’ or overlap with the EPO was noted here before, giving as a prominent example Jana Mittermaier, ex-Transparency International worker and now PR person for the EPO (or “Mittermaier the Liar” as I cautiously called her the other day, after she had relayed the management's lies about its union-busting activity). That’s what one reader told us about them. 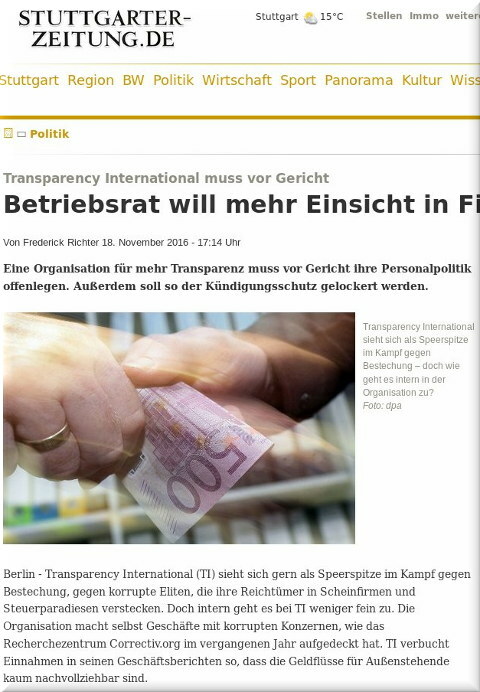 Transparency International is in crisis. The organization needs to cut costs and restructure its international secretariat in Berlin. At the same time, Transparency is fighting against its workers’ council in the local courts. In a bid to ease tensions, Transparency has also now made changes to its leadership. This bodes negatively not just for the EPO but also for Germany. And it’s not all that much better in The Hague, where a Dutch speaker (speaking on behalf of the EPO) got away with saying on Dutch television that he would snub the highest court in the country! –AnonymousNeanderthal standards in the Netherlands towards journalists and bloggers too can be tolerated? Remember that the EPO threatens me over my writings about the EPO and it also banned/blocked IP Kat to suppress access/publication. Where were Dutch politicians when the EPO threatened publishers and around the same time spoon-fed Dutch ‘journalists’ some libel to spread (publish) about an accused judge whom Battistelli does not like? There are also some pro-Battistelli comments there (however few) and these take up a lot time and energy from the on-topic discussions.